Pope Benedict XVI wrote his first Encyclical, Deus Caritas Est (God is Love), about Divine Love. In the introduction the Holy Father wrote: “I wish in my first Encyclical to speak of the love which God lavishes upon us and which we in turn must share with others...” He reminded us that the Christian vocation is “not the result of an ethical choice or a lofty idea, but the encounter with an event, a person, which gives life a new horizon and a decisive direction.” This fact of Christian discipleship, that we are first loved by God and in coming to know that love find the capacity to share it, stands behind the readings we hear for this Sunday. The first reading relates a key moment in the Acts of the Apostles. In this scene, Peter is in the house of a Gentile, Cornelius. Peter is there through the inspiration of the Holy Spirit; and when that same Spirit pours forth upon his hosts in the Gentile household, Peter orders them baptized. This moment helps to open wide the doors to the many Gentiles who will respond to Paul’s Spirit inspired preaching as the story of Acts continues. It is important to note that Peter has been brought to this moment by the steady direction of the Lord who prepared him for his mission to Israel, inspired his bold preaching, and now has brought him to the transformative insight that God intends that salvation be preached to all the nations. On a deeper level, however, Peter’s capacity for insight and openness may be traced back to the Passion and the very moment of the denial. In the Gospel of Luke, Peter utters his denial in the same courtyard where Jesus stands awaiting his fate. Peter’s failure may be terrible, but it is not hopeless. Earlier, Jesus prayed for him at the Last Supper, that he would turn back and strengthen his brothers. Now in that courtyard, Jesus looks at Peter. 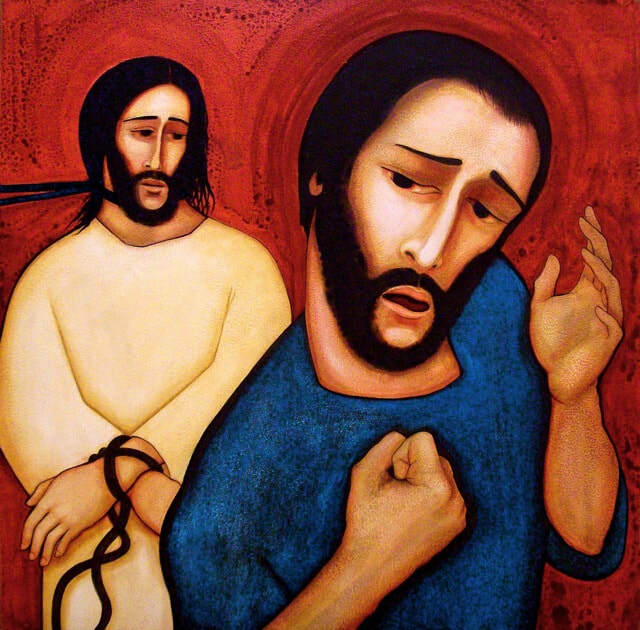 It is in that electric moment- in the encounter with Jesus- that Peter remembers the words of Jesus and repents. His transformation begins not by his own insight or strength, but by the love that the Lord offers to him. Reading the Psalm through the prism of the experience of the early Church we recognize God’s gracious intentions revealed prophetically. The Psalm echoes the joyful news of the baptism of Cornelius and his household. In his infinite love, God has chosen to make all the nations his chosen people. The one and only commandment of Jesus to be found in the Gospel of John is the command to love. The second reading today is taken from the First Letter of John, a letter that reflects upon John’s Gospel and applies its teachings to the next generation of Christians. It reminds those believers, and us, that God takes the initiative in relationship with us. God loves us first. In this we come to know love and to know God. If we are to respond authentically it can only be by sharing what we have received. This fundamental test of authentic Christian life is drawn from today’s Gospel passage. The passage follows upon last week’s beautiful image of the vine and the branches. It forms part of a lengthy farewell which Jesus speaks to his disciples at the supper before his arrest. In this intimate setting, in which Jesus has already washed their feet, he expresses his heart’s desire- that they love as he has loved them. He is about to demonstrate the depth of his love as he is lifted up on the cross. He speaks to them of his bond with the Father and invites them to share in that bond. I wonder if we can fully appreciate the emotion of that moment as the Son of God tells them that they are not servants, but his friends. To his friends he leaves his only legacy - not wealth, wisdom, or might, but love- the very power of God. The words Jesus spoke to those disciples long ago, he now speaks to us as he once again lays down his life for us upon the altars of our churches. He chooses us in love to be his friends and empowers us to love. He does not demand a price or any task from us. All he really asks is that we allow ourselves to be loved by the author of love. Remaining, abiding in that love we find our destiny.